A chronic inflammation of the eyelid margin. 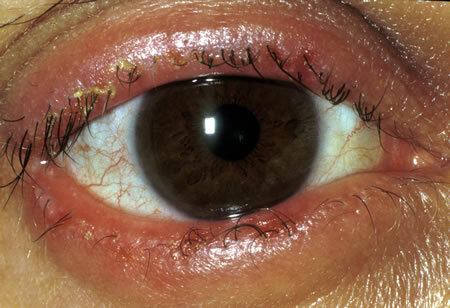 It is associated with obstruction of the openings of the meibomian glands (posterior blepharitis), or formation of scales at the bases of the eyelashes with mild inflammation and bacterial infection (anterior blepharitis). Secondary disruption of the tear film is common. The underlying cause is not clear. 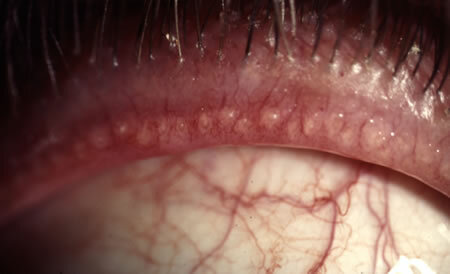 Posterior blepharitis may co-exist with rosacea of the face. Careful cleaning of the lid margin with cotton buds dipped in very dilute baby shampoo (a drop in an egg-cup of water) or weak sodium bicarbonate solution ( a pinch of powder in an egg-cup of water). Aim to clean at the bases of the lashes of top and bottom eyelids initially twice per day then reduce as symptoms improve to around twice per week.